A short history and explanation of the ideas and practice of council communism. Council communism was a militant workers' movement that first emerged in Germany and the Netherlands during the 1920s. Today it lives on as an important theoretical current that inspires libertarian communists. The central (and simple) argument of council communism, in stark contrast to both reformist social democrats and Leninists, is that workers’ councils which arise in workplaces and communities during periods of intense struggle are the natural form of working class organisation. This view is completely opposed to reformist or Leninist arguments which stress that the working class are incapable of doing anything by ourselves and need to rely on vanguard parties, ballot boxes (and the capitalist state institutions that both of these entail) to sort out our problems. These conclusions lead council communists to maintain very similar positions to those held by class struggle anarchists and revolutionary syndicalists with the main difference often, but not always, being a commitment to Marx and his methods of analysis. As such there are historical and present day instances of close cooperation between the two currents, even to the point of many inspired by council communism becoming members of class struggle anarchist and revolutionary syndicalist groups. Following from this, council communists argue that society and the economy should be managed by coordinations of workers’ councils, made up of delegates elected at workplaces and can be recalled at any moment by those who elected them. As such, council communists oppose bureaucratic state socialism. They also oppose the idea of a revolutionary party seizing power, believing that any social upheaval led by one these ‘revolutionary’ parties will just end up in a party dictatorship. Otto Rühle, a key contributor to the development of council communism famously penned that the revolution is not a party affair. Instead council communists believe that the role of a revolutionary organization is not to perform the revolution for the working class, but only to agitate within the class, encouraging people to take control of their own struggles through the directly democratic institutions of workers’ councils. It’s sometimes been thought that council communists have maintained an ‘outside and against’ position on bureaucratic reformist trade unions, seeing them as a brake on workers’ militancy and believing that the leadership, whose role is seen as little more than ‘cops with flat caps’, will always eventually sell out the membership. It is true that, historically at least, council communists have been anti-trade union. However, this has largely been due to the context in which council communists were writing. For instance, German council communists of the 1920s were fully aware of the German trade unions’ role in betraying the attempted workers’ revolution in 1918. However, in modern times, though keeping a very critical view of trade unions and their undemocratic nature, those inspired by council communists generally believe in forming autonomous class struggle organizations that agitate in and beyond the unions. Council communists obviously also held a strong criticism of the ‘successful’ Russian revolution of 1917. Though they felt that originally it had a pro-working class nature about it, it ended up being a bourgeois revolution, with the new ‘communist’ leaders replacing the old feudal aristocracy with a state capitalist bureaucracy. The council communists hold that the Bolshevik Party just took over the role of individual capitalists rather then got rid of it. The council communists emerged largely out of the German rank-and-file trade union movement, who opposed their unions and organised increasingly radical strikes towards the end of 1917 and the beginning of 1918. These formed into the Communist Workers’ Party of Germany (KAPD), it's workers' union the AAUD, and the AAUD-E, whose hey-day was in the attempted German revolution of 1918-19. Similar tendencies developed within the workers’ movements of Italy, Bulgaria and the Netherlands. The brutally repressed but briefly successful anti-USSR workers' uprising in Hungary 1956 is often used as a practical example of how workers' councils can arise naturally out of the working class during periods of intense class struggle, even despite the workers' lack of explicit commitment to council communist theory. Council communist ideas have since been taken on by many libertarian communists around the world with groups like Socialisme ou Barbarie and the Situationist International being greatly influenced by them. However council communists were never part of the anarchist tradition, and so grouping them with libertarian communists is seen to be inaccurate. This said the AAUD-E later did work towards rapprochement with class struggle anarchists and revolutionary syndicalists in the Block Antiautoritärer Revolutionäre. Considering this along with their anti-Bolshevism, anti-partyism, and anti-statist approach to the dictatorship of the proletariat it is appropriate to see council communists an anti-authoritarian current in the historical workers' movement. However, these groups are sometimes designated derogatively as 'councilist' by left communists, for overtly obsessing over workers' spontaneity and submitting to what Mark Shipway describes as 'an empty, formalistic emphasis on workers’ councils which completely neglects the communist content of the council communist equation.' This is perceived as dangerous because it is possible that workers might be able to spontaneously take over the means of production during a crisis but only end up establishing a form of 'self-managed capitalism' in which federated workers' councils govern the world but unpleasant capitalist wage relations are still retained. Council communists in contrast think that the working class must develop to possess a strong political consciousness and have communism and the abolition of capitalism set as their goal; the councils are only the means by which this goal can be realised. This was also the criticism made by the left communists in the KAPD when the AAUD-E split from them in rejection of a separate political (party) organisation of communists. Council communism - Mark Shipway - Easily-readable introduction to council communist theory. Workers’ Councils - Anton Pannekoek - Arguably one of the defining texts of council communism, Pannekoek explains how workers councils are organs of working class power and a means towards overthrowing capitalism. The Revolution is not a Party Affair - Otto Ruhle - Classic text outlining council communism's opposition to parliamentarism and political parties. 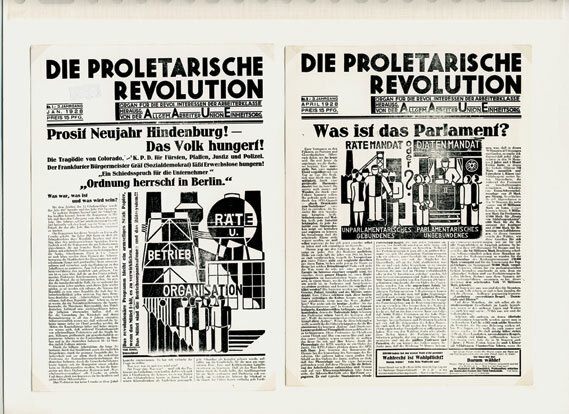 The communist left in Germany 1918-1921 - Gilles Dauvé and Denis Authier - Excellent history of the 1918 German Revolution and the turbulent years following it, with an emphasis on the role played by council communists. I don't think the links on SouB and the Sit's is fully functioning? By the way, in giving SouB as a follow up it is worth a line somewhere pointing to the distinction made by many between 'Council Communism' and 'Councilism' dealt with in the excelent short introduction by Mark Shipway in the 'Marxist.Org' link. Marks short book on 'Anti-Parliamentary Communism in Britain - The movement for workers councils in Britain 1917-45' is also worth a mention. Also in the 'more information' section at the end of the article shouldn't the link to Knighrose's former geocities site for Subversion material be updated to link to the AF North website or to link to the Subversion and Wildcat pages in the library here. I think Marcel van der Linden text 'on council communism' is quite useful in that is is an outline of it as a political movement and draws on some of the non-English sources IIRC. I think users can edit content, so I might make these changes. This FB group may be of interest to some. Thanks klas batalo for the nicely put together reading list.